Forty years ago, Jim (Buddy) Johnston didn’t have much to work with — the six warm bodies who reported to the first practice he convened, along with one lacrosse stick and a couple of battered shoulder pads. From that modest assortment of spare parts, the Kitchener-Waterloo Braves were born. And today, long after their founding father has left the team, they’ve taken on a life of their own. “It wasn’t much. But it was a start,” said Johnston, now 73. He scratches his head in amazement when he thinks how far the team he founded has come. The Braves are still putting together the finishing touches to their 40th-anniversary celebrations. And they’ll have plenty to commemorate. From their impressive third-place finish in their inaugural season in the Ontario Lacrosse Association’s Junior B ranks in 1967, the Braves went on win two Founders Cup national titles (1987, 1988). They made the leap up a tier, to the Junior A league in the early 1990s. Since then, though, team successes have been limited. In fact, the Braves have not recorded a playoff series win in 14 long years. But that’s not to diminish the longevity of the team, which has produced some 30 players who went on to professional lacrosse careers. Some of them — like current National Lacrosse League stars Steve (Chugger) Dietrich, Colin Doyle and most recently, Ryan Benesch — are among the sport’s most recognizable names. I never saw that coming,” said Johnston, a semi-retired electrician in Waterloo. Johnston abandoned the game in 1972, after he lost his leg in a car crash in Shakespeare. He left a huge mark on the sport locally, as the Braves’ original coach and general manager. Back in 1967, Johnston was a charter executive member of the Kitchener Rangers and it was through his affiliation with the hockey team that he met the late Bob Crosby, then the manager of the Kitchener Auditorium. The Aud stood empty in the summers in those days. So, Crosby asked Johnston if he might organize a lacrosse team to help fill the void. The 33-year-old Johnston, who had grown up playing lacrosse on a dairy farm outside Orangeville, was more than happy to oblige. 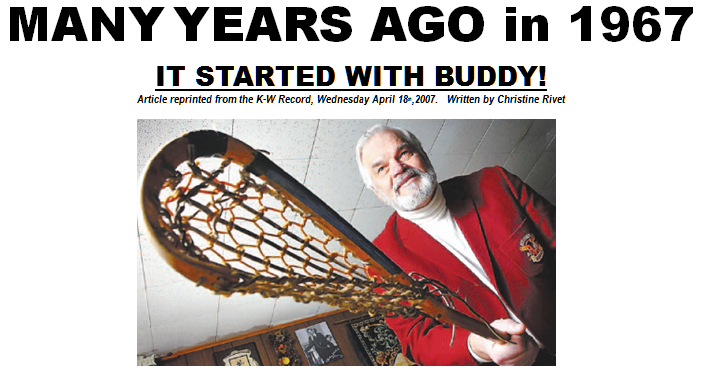 He christened the team as the Kitchener Braves as a tribute to the game’s aboriginal roots. Johnston designed the crest, organized the executive and scrounged up $5,000 for equipment. All that was left to do was to find more players. Lacrosse hall of famer Ross Powless, then the coach of the Senior A Brantford Warriors, and Johnston hammered out an affiliation agreement between the clubs, clearing a path for some established junior players such as Ross’s son and goalie, Gary Powless, Gene and Vic Generoux, Brian Caven and Gil Bomberry to suit up with the Braves. Another recruitment drive in Owen Sound unearthed players like George Irwin, Ron Yee and Chris Gavris. To that mix, Johnston added a number of local players like Tom Smola, Ray Hallman, Terry Hein, brothers Jim and Joe McCrea . The franchise’s home opener was played in May 1967 when the Braves fell 6-3 to Elora before 505 fans who coughed up a buck to watch at the Aud. The Braves finished with a record of eight wins and six losses in their inaugural season in an eight-team loop that featured the Elora Mohawks, Mimico Mounties, East York Hawks, Dixie Beehives, Huntsville Hawks, Brooklin Steelers and Rexdale Warriors. Kitchener eventually bowed out in the playoffs to the soon-to-be Canadian champs from Elora . Not all of Johnston’s memories are quite so happy. In one first-season game, on June 19, the Braves tamed Brooklin 10-7, though an unbelievable 116 minutes in penalties were called, along with two game misconducts and a match penalty. Johnston — who handed over the coaching duties to J.J. Hill in 1968 but remained the GM — has particularly bitter remembrances of that season. The seventh-place Braves were in the driver’s seat against Bramalea in the deciding game of their first-round playoff series. These days, Johnston takes in the occasional Braves game at the Waterloo Memorial Rec Complex, but spends most of his time playing golf and snooker. He’s also working on a CD of Sinatra-style songs. However, lacrosse, and especially his Braves, will always remain close to his heart.